Boost Mobile invites you to switch to Boost and get 4 lines, each with Unlimited Gigs, for $100/month, in a new commercial. 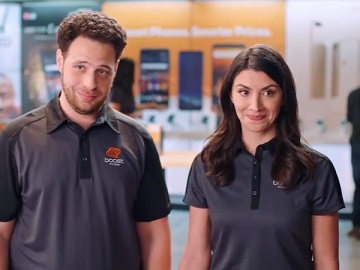 The 30-second spot features a couple in a Boost Mobile store, talking about what they get if they switch. “So if we switch, he can stream all the games he wants without eating up our family’s data?” the woman asks the two employees. “That’s right. Four lines for just $25 a month per line, each with unlimited gigs,” one of the Boost Mobile customer representative tells her. At this point, the woman’s husband, who’s been watching a soccer game, celebrates a touchdown from the top of his lungs. “Honey, ready for a switch?” his wife asks him. “Yeah, baby,” he answers in a chilled out voice. “Ready to stream every play? Switch to Boost and get four lines with just $25 per month per line, each with unlimited gigs. Plus, get up to 4 free phones, all on a new super reliable, super fast nationwide network,” the voiceover highlights at the end of the commercial, adding the company’s tagline, “Boost makes it easy to switch. Switching makes it easy to save”.